Originally published under the title "Steering Europe's future: Islamic violence will decide the continent's destiny." STOCKHOLM, Sweden – While visiting predominantly Muslim suburbs emerging outside nearly all northern European cities, one question keeps recurring: Why have some of the richest, most educated, most secular, most placid, and most homogeneous countries in the world willingly opened their doors to virtually any migrant from the poorest, least modern, most religious, and least stable countries? Other questions follow: Why have mostly Christian countries decided to take in mostly Muslim immigrants? Why do so many Establishment politicians, most notably Germany's Angela Merkel, ignore and revile those who increasingly worry that this immigration is permanently changing the face of Europe? Why does it fall to the weaker Visegrád states of eastern Europe to articulate a patriotic rejection of this phenomenon? Where will the immigration lead? There's no single answer that applies to multiple countries; but of the many factors (such as secularization) behind this historically unprecedented acceptance of alien peoples, one stands out as most critical: a west European sense of guilt. Why do politicians welcome immigration that is changing the face of Europe? To many educated western Europeans, their civilization is less about scientific advances, unprecedented levels of prosperity, and the achievement of unique human freedoms, and more about colonialism, racism, and fascism. The brutal French conquest of Algeria, the uniquely evil German genocide against the Jews, and the legacy of extreme nationalism cause many Europeans, in the analysis of Pascal Bruckner, a French intellectual, to see themselves as "the sick man of the planet," responsible for every global problem from poverty to environmental rapacity; "the white man has sown grief and ruin wherever he has gone." Affluence implies robbery, light skin manifests sinfulness. Pascal Bruckner argues that European remorse for past sins prompts self-hatred. 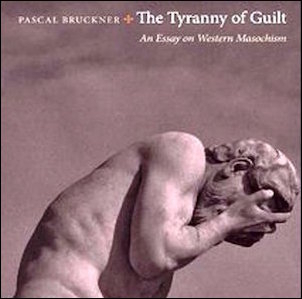 Bruckner labels this the "tyranny of guilt" and I encountered some colorful expressions during my recent travels of such self-hatred. A French Catholic priest expressed remorse over the record of the Church. A conservative German intellectual preferred Syrians and Iraqis to his fellow Germans. A Swedish tour guide put down fellow Swedes and hoped he would not be perceived as one. 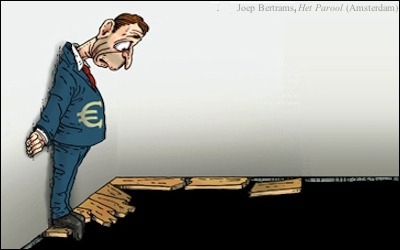 Indeed, many Europeans feel their guilt makes them superior; the more they dislike themselves, the more they preen – inspiring a strange mix of self-loathing and moral superiority that, among other consequence, leaves them reluctant to commit the time and money required to bear children. "Europe is losing faith in itself, and birth rates have collapsed," notes Irish scientist William Reville. The catastrophic birth dearth underway has created an existential demographic crisis. With women of the European Union bearing just 1.58 children as of 2014, the continent lacks the offspring to replace itself; over time, this far-less-than-replacement rate means a precipitous decline in the numbers of ethnic Portuguese, Greeks, and others. To maintain the welfare state and the pension machine requires importing foreigners. These two drives – expiating guilt and replacing nonexistent children – then combine to encourage a massive influx of non-Western peoples, what the French writer Renaud Camus calls "the great replacement." 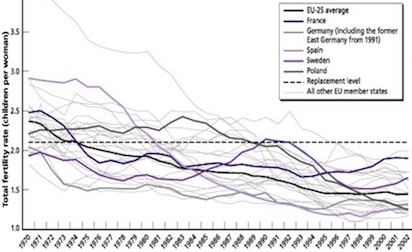 European fertility rates declined greatly in recent decades. South Asians in the United Kingdom, North Africans in France, and Turks in Germany, plus Somalis, Palestinians, Kurds, and Afghans all over, can claim innocence of Europe's historic sins even as they offer the prospect of staffing the economy. As the American writer Mark Steyn puts it, "Islam is now the principal supplier of new Europeans." The Establishment, or what I call the 6 P's (politicians, police, prosecutors, the press, professors, and priests), generally insists that everything will turn out fine: Kurds will become productive workers, Somalis fine citizens, and Islamist problems will melt away. That's the theory and sometimes it works. 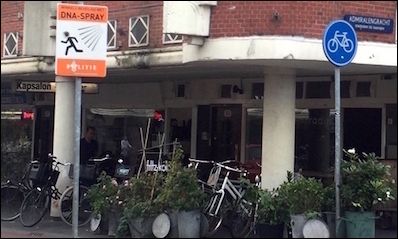 Far too often, however, Muslim immigrants remain aloof from the culture of their new European home or reject it, as most clearly manifested by gender relations; some violently attack non-Muslims. Far too often too, they lack the skills or incentive to work hard and end up an economic liability. The influx of non-integrating Muslim peoples raises the profound question whether Europe's civilization of the past millennium can survive. Will England become Londonistan and France an Islamic republic? The Establishment castigates, dismisses, sidelines, ostracizes, suppresses, and even arrests those who raise such issues, demeaning them as right-wing extremists, racists, and neo-fascists. Nonetheless, the prospect of Islamization prompts a growing number of Europeans to fight on behalf of their traditional way of life. Leaders include intellectuals such as the late Oriana Fallaci and novelist Michel Houellebecq; politicians such as Viktor Orbán, the prime minister of Hungary, and Geert Wilders, head of the most popular Dutch party. Anti-immigration political parties typically win about 20 percent of the vote. And while a consensus has emerged that their appeal will stay about there, perhaps reaching 30 percent, they could well continue to grow. Opinion polls show that very substantial majorities fear Islam and want to stop and even reverse the effects of immigration, especially that of Muslims. In this light, Norbert Hofer recently winning 50 percent of the vote in Austria represents a potentially major breakthrough. The greatest question facing Europe is who, Establishment or populace, will steer the continent's future. The extent of Islamist political violence will likely decide this: a drumbeat of high-profile mass-murders (such as in France since January 2015) tilts the field toward the people; its absence allows the Establishment to remain in charge. Ironically, then, the actions of migrants will largely shape Europe's destiny.